This page is a general resource for information specific to the Maple. We went through three versions (“Revs”) of the Maple hardware: Rev 1, Rev 3, and Rev 5 ; Rev 5, the final design, is currently on sale. The following sections will help you to help you identify your Rev. These boards went on sale in November 2010. 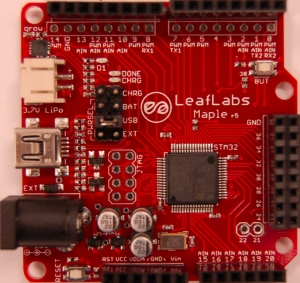 They have white buttons and “r5” in small print near the “LeafLabs Maple” text next to the “infinity leaf” logo. The Maple Rev 5 repositioned the double header on the right hand side to better fit 0.1 inch pitch breadboard. This necessitated the removal of pins 21 and 22 from the double header; they are still available, but don’t have any headers installed on them. This batch of boards went on sale beginning in May 2010. They have a darker red silkscreen and the “infinity leaf” logo. The Maple Rev 3 was the first version which includes the built-in button, labeled BUT. 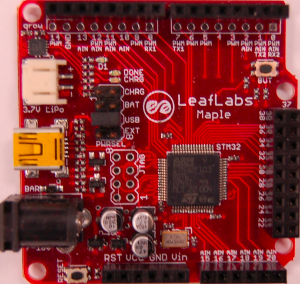 A small number of Maple Rev 1 boards went on sale in late 2009. They have a light red silkscreen and a single pixelated leaf as a logo. The Maple’s power source is determined by the header to the left of the “LeafLabs” label on the silkscreen. All versions of the Maple can be powered from the barrel jack connector, USB, or a LiPo battery. We ship the Maple with a jumper on the USB selector. In order to power it off of an alternative source, unplug the Maple, then move the jumper to the desired selector before reconnecting power. You can also power the Maple via the pin labeled “Vin” on the lower header. This pin feeds into both the digital and analog voltage regulators. However, don’t do this while simultaneously powering the board from another source, or you could damage it. When powering the board from a barrel jack, double check the polarity of the barrel. The appropriate polarity is noted on the silkscreen right next to the connector. Silkscreens on Maples up through Rev 5s manufactured in Spring 2011 falsely indicated that the barrel jack could be supplied by up to 18V. (Rev5s manufactured after Spring 2011 may still have this error on the silk, but it has been marked over.) We recommend a barrel jack input voltage no greater than 12V, and potentially even lower depending upon the current draw requirements of the application. The same goes for powering off LiPo batteries. Maples Rev 3 and Rev 5 also have a built-in LiPo battery charger. In order to use it, put a jumper across the CHRG header on the power selection header and across the USB, or EXT selectors, depending on whether you’re charging the battery via USB cable or barrel jack connector. The LED labeled CHRG will light up while the battery is being charged. When the battery is finished charging, the LED labeled DONE will light up. The Maple features 38 ready-to-use general purpose input/output (see GPIO) pins for digital input/output, numbered D0 through D37. These numbers correspond to the numeric values next to each header on the Maple silkscreen. More GPIOs (numbered D39–D42 on the back of the Maple’s silkscreen) are available if you use the disableDebugPorts() function; see the board-specific debug pin constants for more information. (See this erratum for information about the pin numbered 43 on the silkscreen). The following table shows which pins connect to which EXTI lines on the Maple. The Maple has three serial ports (also known as USARTs): Serial1, Serial2, and Serial3. They communicate using the pins given in the following table. The six pins at the bottom right of the board (D15—D20) generally offer lower-noise ADC performance than other pins on the board. If you’re concerned about getting good ADC readings, we recommend using one of these pins to take your measurements. Maple has an electrically isolated analog power plane with its own regulator, and a geometrically isolated ground plane. Pins D15—D20 are laid out to correspond with these analog planes, and our measurements indicate that they generally have the lowest noise of all the analog lines. However, analog performance may vary depending upon the activity of the other GPIOs. Consult the Maple hardware design files for more details. This section lists the Maple’s board-specific values. 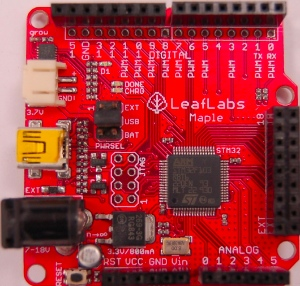 The hardware schematics and board layout files are available in the Maple GitHub repository. The design files for Rev 1, Rev 3, and Rev 5 are respectively in the maple-r1, maple-r3, and maple-r5 subdirectories. A schematic for a JTAG adapter suitable for use with Maple is available in the jtagadapter directory. The following are known failure modes. The failure modes aren’t design errors, but are easy ways to break or damage your board permanently. High voltage on non-tolerant pins: not all header pins are 5V compatible; so e.g. connecting certain serial devices in the wrong way could over-voltage the pins. The pin-mapping master table details which pins are 5 V tolerant. This section documents design flaws and other errors. Barrel jack power supply voltage mistake: The acceptable voltage range given next to the barrel jack on the Maple through Rev 5s manufactured in Spring 2011 is incorrect. The given range is 7V — 18V. In fact, 18V is too high and should not be supplied to your board. The original voltage regulators used on the Maple were rated up to 18V. However, the voltage regulators on current Maple Revs are rated up to only 16V, and due to the current draw requirements of the board, operate properly only up to 12V. The recommended maximum voltage you should apply is 12V, and potentially even lower depending upon the current draw requirements of the application. Please see Power Regulation on the Maple for more information. Reset and PB4 tied together: The Maple’s reset line is also connected to PB4, which is labeled on the silkscreen as pin 43. Thus, attempting to use pin 43 as a GPIO can reset your board. This has other implications. Since PB4 is also the JTAG NJTRST line, this prevents the JTAG “reset halt” command from working properly. Power supply marketing mistake: We originally sold the Maple advertising that it was capable of supplying up to 800 mA; the correct value is 500 mA. PWM marketing mistake: We originally advertised the Maple as having 22 PWM-capable pins; the correct number is 15. ADC marketing mistake: We originally advertised the Maple as having 16 analog input pins. Due to the following issue, the correct number is 15. The following subsections lists known issues and warnings for each revision of the Maple board. Pin 3 AIN missing: Pin 3 is capable of analog input, but on Rev 5s manufactured during Fall 2010, the corresponding “AIN” is missing from its silkscreen. This mistake was fixed in later manufacturing runs. Pin 3 AIN missing: Pin 3 is capable of analog input, but the corresponding “AIN” is missing from the Rev 3 silkscreen. Bad/Sticky Buttons: a number of Rev 3 boards sold in May-June 2010 have questionable RESET and BUT buttons. What seems to have happened is that the flux remover we used to clean the boards before shipping eroded the plastic internals, which resulted in intermittent functionality. All buttons on all shipped boards did function in testing, but some may have been unreliable in regular use. If you have this problem, we will be happy to ship you new buttons if you think you can re-solder them yourself, or you can ship us your board and we will swap out that part. For reference, the button part number is KMR211GLFS and the flux remover we used is “Precision Electronics Cleaner” from RadioShack, which is “Safe on most plastics” and contains: dipropylene glycol monomethyl ether, hydrotreated heavy naphtha, dipropylene glycol methyl ether acetate (say that three times fast! ), and carbon dioxide. Resistors on pins 0 and 1: these header pins, which are RX/TX on USART2 (Serial2), have resistors in-line between the STM32 and the headers. These resistors increase the impedance of the lines for ADC reads and affect the open drain GPIO functionality of the pins. These resistors were accidentally copied over from older Arduino USB designs, where they appear to protect the USB-Serial converter from TTL voltage on the headers. Silkscreen Errors: the silkscreen on the bottom indicated PWM functionality on pin 25 and listen the external header GND pin as number 38 (actually 38 is connected to the BUT button). We manually sharpied over both of these mistakes. ADC noise: generally very high, in particular when the USB port is being used for communications (including keep-alive pings when connected to a computer). This issue was resolved in Rev 3 with a 4-layer design and a geometrically isolated ADC Vref plane. Silkscreen Differences: the pin numbering scheme on Rev 1 is different from Rev 3, and thus Rev 3 software is difficult to use with Rev 1 boards. Notably, the analog input bank is labeled A0-A4 on Rev 1 but 15-20 on Rev 3, and the extra header bank does not have a pinout table on the bottom. No BUT Button: the BUT button, useful for serial bootloading, was only added in Rev 3. As a workaround, you can directly short the appropriate MCU pin to Vcc; see this forum posting. STM32F103RB overview page with links to further references. Revs 2 and 4 were prototypes that didn’t pass internal testing.